Der Mennonitische Druckverein: (Mennonite Printing Association), the first Mennonite publishing organization in America. Soon after the founding of the Eastern District Conference on 28 October 1847, John H. Oberholtzer, who had taken the leadership in the new conference, decided to publish a periodical which would promote and unify the church. It was also his hope that the old breach might be healed through such a paper. Accordingly with a certain heroism he purchased a hand printing press with his much-needed money and set it up in his locksmith shop near Milford Square, Bucks County, Pa. His first publication was Verhandlungen des Hohen Rathes der Mennoniten Gemeinschaft (gedruckt bey Johann H. Oberholtzer, n.p., n.d.), a broadside, published in 1848. This would suggest that he set up his print shop at once after the division. 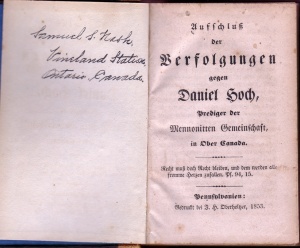 He wrote, edited, set type, printed, and mailed out his first paper, Der religiöse Botschafter, a biweekly, on 9 June 1852, the first successful Mennonite periodical in America. It required tremendous efforts to continue this work together with his busy ministry. Sometimes he worked all night in the shop without sleep to get the copies out. Perhaps, more than will ever be known, this paper helped to form the bond of fellowship among scattered groups of Mennonites hungering for new life in the church, which led to the General Conference Mennonite Church in 1860. Oberholtzer continued his printing until 1856, when, on account of financial difficulties, a group of local Mennonites formed a stock company under the name "Der Mennonitische Druckverein" and took over the press. The constitution of this organization was printed by Oberholtzer under the date of 31 May 1856. Oberholtzer continued to edit the paper until 1867, although the name was changed on 30 July 1856, to Das Christliche Volksblatt. A young man, John G. Stauffer, then established the press in the village of Milford Square. Stauffer entered the business in November 1856 and after six months' apprenticeship assumed the management and acted as compositor, printer, foreman, and in part as bookkeeper and assistant editor. The chief business of the Druckverein was the publication of the Volksblatt, but some book and job printing was also done. For many years Stauffer and his younger brother, Daniel G. Stauffer, continued as printers in Milford Square, publishing a number of religious periodicals for Mennonites and other groups, The Free Press, in the nearby town of Quakertown, is an outgrowth of this printing venture. The Druckverein erected a brick building in Milford Square as a printing house. The annual meeting of the stockholders on 1 Dec. 1866, decided to transfer its publication work to the newly established school (Christliche Bildungs-Anstalt der Mennoniten Gemeinschaft, later known as Wadsworth Mennonite School) at Wadsworth, Ohio, provided that certain conditions could be met, giving as one of the chief reasons the expectation that the professors and students would participate in the publication. This plan failed to materialize, however, and the publication continued at Milford Square. The name of the paper was changed to Der Mennonitische Friedensbote beginning in January 1867, when it also became a monthly instead of semimonthly. The publication was placed under a Publication Committee, but the printing was henceforth taken over by J. G. Stauffer as a private venture, who apparently at this point purchased the printing establishment from the Druckverein. The Druckverein continued to be the publisher of the Friedensbote until the end of 1871. At that point the Eastern District Conference took over the publication with J. G. Stauffer continuing as printer. The conference, at its meeting in October 1871, accepted the proposal of the Druckverein to take over the Friedensbote and appointed a Publication Board of five members to handle the journal and any other publications desired by the conference. A: Oberholtzer imprints: (1) Verhandlungen des Hohen Rathes der Mennoniten Gemeinschaft (broadside in 1848, reprinted as broadside in 1849); (2) Religiöser Botschafter (1852-56, then Das Christliche Volksblatt 1856-66) ; (3) J. H. Oberholtzer, Aufschluss der Verfolgungen gegen Daniel Hoch (1853, pp. 168); Part II, Samuel B. Bauman, Eine Erleiterung an Benjamin Eby (1855, pp. 108); (4); idem, Lieder für die Tauf-Kinder (broadside, 1854? ); (5) Gottfried Arnold, Geistliche Erfahrungs -Lehre (1854, pp. 504); (6) Constitution des Mennonitischen Druck-Vereins (1856). B. Druckverein imprints: (1) C. N. Hall, Komm zu Jesu (1857, pp. 96); (2) Das unparteiische biblische Fragenbuch (1859, pp. 121); (3) J. H. Oberholtzer, Der wahre Character von J. H. Oberholtzer (1860, pp. 115); (4) Gemeinde-Ordnung ... Summerfield (1861, pp. 36); (5) A. Hunzinger, Das Religions-, Kirchen-, und Schulwesen der Mennoniten oder Taufgesinnten (1862, pp. 162); (6) Katechismus (1863, pp. 105). Krehbiel, H. P. History of the General Conference of the Mennonites of North America. [Canton, Ohio], 1898: 364 ff. "Life of J. H. Oberholtzer." The Mennonite (March 1895): 44. Fretz, A. J. Stauffer-Stover Family History. 1899: 264. Battle, J. B. History of Bucks County, Pennsylvania. Philadelphia, 1887: 1067 f.
Bender, Harold S. "Mennonitische Druckverein." Global Anabaptist Mennonite Encyclopedia Online. 1955. Web. 20 Apr 2019. http://gameo.org/index.php?title=Mennonitische_Druckverein&oldid=121053. Bender, Harold S. (1955). Mennonitische Druckverein. Global Anabaptist Mennonite Encyclopedia Online. Retrieved 20 April 2019, from http://gameo.org/index.php?title=Mennonitische_Druckverein&oldid=121053. Adapted by permission of Herald Press, Harrisonburg, Virginia, from Mennonite Encyclopedia, Vol. 3, p. 644-645. All rights reserved.